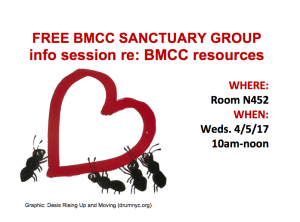 This site is a collection of information and resources about sanctuary, at BMCC and beyond. This entry was posted in Announcements, Events on March 24, 2017 by Kirsten Cole. This entry was posted in Announcements, Events on March 3, 2017 by Soniya Munshi.